On the face of it, running is a positive thing to do. Getting outdoors, being healthy, moving forward with nothing other than your legs to carry you. On top of that, thousands of runners raise millions of pounds for charity each year. How could running be anything other than an ethically sound, environmentally friendly activity? It’s a no-brainer, right? Like everything, there are hidden negative effects or unintended consequences that we need to consider if we are to avoid causing more harm than good. For example, as runners we are faced with a multitude of questions that we can answer in a positive way, or a negative way. Start and finish our runs from the front door; or drive somewhere to run? Enter an event close to home; or fly overseas? Take home drinks bottles and recycle them; or chuck them in a hedge? Stick to the path; or trample through untouched undergrowth? Wear kit made from recycled, organic, or fairtrade materials; or wear kit made in sweatshops using materials derived from non-renewable sources? None of us can be perfect all of the time, and we’re not here to point the finger and blame anyone, but it is important that we recognise the issues and try to make as many positive decisions as possible. The same is true of Lonely Goat Running Club. This is a positive website and community, but we do still have a responsibility to consider our impact on the planet and everyone and everything we share it with. Lonely Goat strives to be a positive, ethical organisation in everything we do, but we recognise that we are not perfect. We believe it is important to be honest and open, so we’re not going to hide away from our faults or try and “greenwash” them. Instead, we’re going to strive to be the best organisation we can be. We may never be perfect – it may be impossible – but we do intend to share our pursuit of ethical perfection with you. For example, we’re a growing organisation and sell merchandise to support that growth. Inevitably, the production of that merchandise will have an impact on the environment. The first step on this journey is to consider our merchandise and what it is made of. Running kit made from ‘virgin’ polyester is derived from non-renewable petrochemicals. This is unsustainable and can have a negative impact on the natural environment. To date, this is what our kit has been made from, but we want to do better than that. 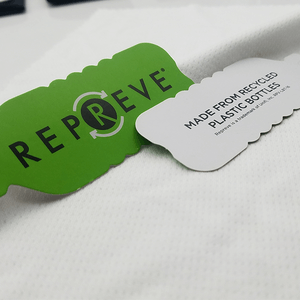 Repreve is a synthetic fibre made out of recycled plastic – most significantly, plastic bottles. 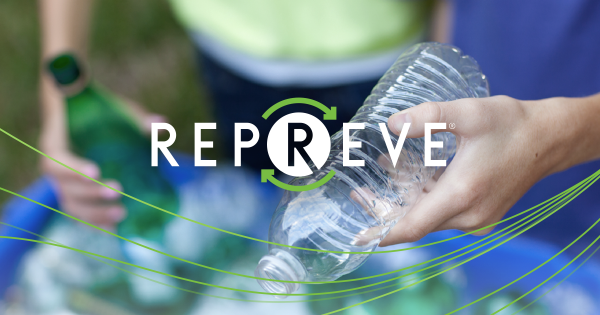 At the time of writing, Unifi, the company that make Repreve, have recycled over 14 billion bottles and are aiming for 20 billion by 2020. In addition to taking plastic out of landfill (80% of plastic bottles are not currently recycled), processing waste plastic into a recycled fibre uses less energy and water than making virgin polyester out of new petroleum. The process emits fewer greenhouse gases and uses less water as a result. The material has all the performance characteristics you would expect from a technical sports fabric, such as breathability and moisture wicking. 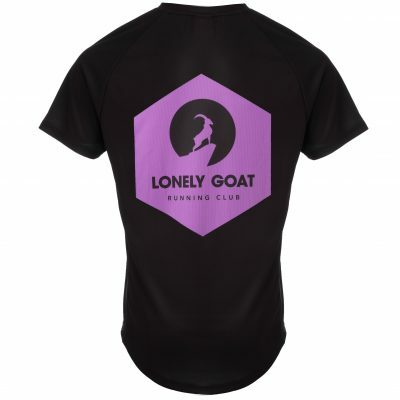 It is perfect for running kit and we are so pleased that we are able to use it for the new range of Lonely Goat merchandise. One of the other brands to use Repreve is Patagonia. For those that aren’t aware, Patagonia have made it their mission to continuously reduce their environmental impact, and they are arguably the industry leaders in this regard. They admit that they are not perfect, and that they cannot solve all the problems they face on their own. But what Patagonia do so well is to highlight the areas they can improve on. They also demonstrate to the rest of the industry what they could be doing – even if this means taking a financial hit. For example, Repreve currently costs more to produce than virgin polyester, which means it costs more for us, and other brands, to use. However, the more companies that use it, the cheaper it will get. It just requires more brands to do the right thing and see cheaper alternatives as being ethically and environmentally irresponsible. Lonely Goat is not a large, multinational clothing company selling millions of items, so our impact is relatively small. That said, if recycled plastic fibres were the norm, adopted wholeheartedly by the wider industry, then the positive impact would be massive. We’ll be very happy if we are able to play a small part in that. We hope you will be too. We’ll look at the ethical choices that we – as a organisation, as a community, and as individuals – face in future articles. Every decision we make has the potential to have a positive or negative impact. We are determined to consider them carefully. For now, you can feel reassured that whatever colour running top you choose (even the new purple range! ), you’ll be #teamgreen too.